2009 Tournament Champ: Oral Roberts defeated South Dakota State 6-2 to win their 12th straight league title. Major League Respect: The Summit League saw seven players selected in the 2009 MLB draft led by Oral Roberts’ RHP Jerry Sullivan who was taken in the third round, 83rd overall by the San Diego Padres. Golden Eagles Soar: Oral Roberts swept the 2009 postseason awards. RHP Mark Serrano claimed the Player of the Year and Pitcher of the Year honors. C Seth Furmanek was named Newcomer of the Year, while ORU head coach Rob Walton earned Coach of the Year honors. The Skinny: To say that Oral Roberts has dominated the Summit League would be an insult to the word understatement. The Golden Eagles not only run roughshod through the postseason by winning 12 straight Summit (formerly the Mid-Continent) League titles, but they have also gone 246-27 (.901) in Summit League regular-season games since joining the conference in 1998. ORU is 36-1 in those conference tournament games. They’ve won 27 straight such games, with the lone loss coming to Southern Utah in 2000. All that success begs the obvious question: Can anyone even challenge Oral Roberts in 2010? Giant Killer: The Gents posted wins over top-ranked Texas A&M and 18th ranked Arkansas in 2009. No Cupcakes: Centenary opens the 2010 schedule in Baton Rouge against defending national champion LSU. They also play a two-game set at another ’09 CWS team, Arkansas, in March. Big Losses: Centenary has to deal with the loss of All-Summit League performers Chris LaLonde (4-0, 6.35 ERA) and Ricky Imperiali (.325, 19 doubles). Travis Leverson led the team with a .386 BA & led the Summit with 18 stolen bases. Who’s Back: Michael Tompkins (.348, 8 HR, 45 RBIs) & Tell Ross (.350, 7 HR, 49 RBIs) will pace the offense. Ace Rising: Justin Kraft (6-4, 4.08 ERA, 4 CG, 77 K in 81.2 IP should be one of the top pitchers in the conference. Northern Exposure: Reigning America East champion Binghamton leaves New York for a 4-game series in Shreveport March 27-29. Boiler Up: IPFW notched two of their 13 wins on the season against Big 10 foe Purdue, sweeping the season series. Mr. Everything: The Mastodons must replace INF Chris Gottschall, who led the team in every offensive category, except triples and stolen bases. Youth Movement: NDSU returns two second team All-Summit League selections in So. P John Straka and So. C Justin Kilne. Straka led North Dakota State with a 4-3 record with a 3.49 ERA and 54 strikeouts. Kline set a Bison freshman record and led the Summit League with a team-leading .432 batting average. Road Warriors: NDSU plays its first 26 games on the road this season before finally opening the home schedule April 13th against Dakota Wesleyan. Record Setter: The Golden Grizzlies must replace infielder Andrew Stafford who broke single-season school records by smacking 82 hits and posting a .381 batting average. Strong Arms: Oakland returns all 10 pitchers who earned a win last season. Tough Test: Oakland opens its season with a three-game series against Mississippi in Oxford. Key Departures: ORU faces the task of replacing Summit League Player of the Year Mark Serrano (9-1, 2.50 ERA), and San Diego Padres first round draft pick Jerry Sullivan (8-3, 3.12 ERA). Key Returners: Senior C Seth Furmanek (.333, 17 HR) and senior INF Colby Price (.342, 10 doubles), lead a potent Golden Eagles offense. Road Tests: Oral Roberts has trips this season to Baylor, UCLA, and Texas. Home Cookin’: Since 1998 ORU’s J.L. Johnson Stadium has hosted either the Mid-Continent or Summit League postseason tournament 10 of 12 times. 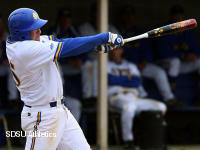 Country’s Best Eh: Junior third baseman Jesse Sawyer was named the top Canadian college baseball player according to CanadianBaseballNetwork.com after setting SDSU single season records for homeruns (19) and total bases (148). Sawyer also led the team with 61 runs scored and 58 RBI. Man on a Mission: Southern Utah third baseman Bo Cuthbertson earned Louisville Slugger Freshman All-America honors and was named to the PING!Baseball All-Freshman third-team after leading the team with a .393 average. Cuthbertson, though, is taking the next two years off while serving on an LDS mission in Uruguay. Thunderbird Hoosiers: SU returns just 15 players from last year’s roster. Career Leader: Newly named assistant coach Keli’i Zablan finished his Thunderbird playing days first in career at-bats and total bases. Tragic Loss: Mike Villano was named Western Illinois head coach November 23rd after Stan Hyman passed away at age 50 after battling leukemia. Big Wins: The Leathernecks first victory last year was a 24-0 win over Medaille, with their second coming four days later over 12th ranked Oklahoma State. Major Opportunities: WIU faces some heavy hitters on this season’s schedule. Included are trips to Oklahoma and Oklahoma State.